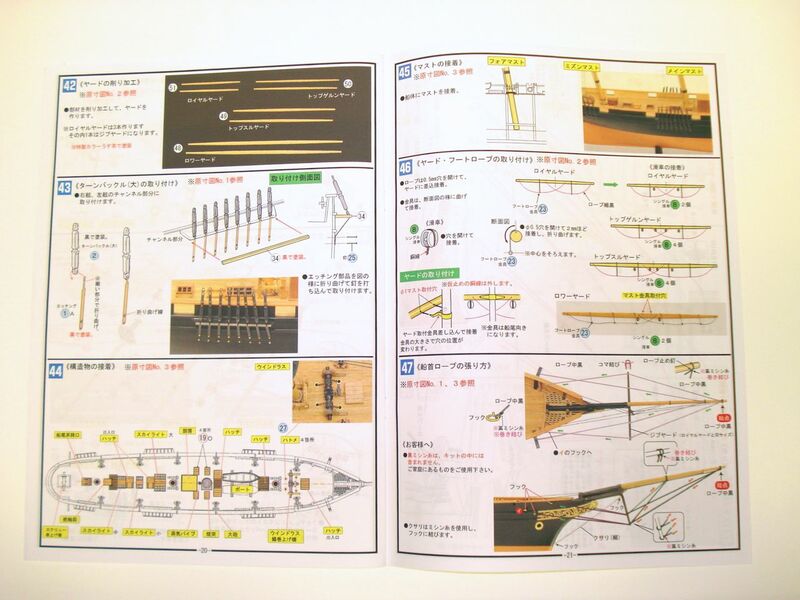 While doing a write-up of one of Woody Joe’s ship model kits, it came to my attention that, while Woody Joe kits are written in Japanese, all the kits of “western-style” ships use the same terms to identify parts of the ship. So, I thought perhaps a couple guides might be helpful to any builders of these kits. The idea stems from the fact that Japanese use a different phonetic alphabet for western or modern words, and they simply write the western terms using this alphabet. If you can learn this alphabet, you can read the names of parts. This alphabet is called Katakana. If you don’t want to know anything about reading Katakana, but just want a list of words in Katakana, skip to the List of Common Terms below. The one caveat in reading Katakana is that western words are modified to fit the Japanese language, as there are many sounds that simply don’t exist in Japanese. It helps a lot if you can speak with a “Japanese accent”. So, instead of saying “mast”, say “mah-s(u)-toh”. Note that the “u” often gets glossed over in Japanese. In another example, instead of “frame”, say “f(u)-rey-m(u)”. Again, just run over those “u”s. So, some words require some reading and re-reading in order to recognize them. Pronunciation of Japanese is actually quite simple and it will help you in reading as it will help you sound out the words. There are 5 vowels in Japanese, and unlike in english, there is only one way to pronounce each vowel. Here’s a guide. It’s not perfect, as some vowel sounds don’t translate exactly to english pronunciation. These are just approximations. Note that vowel are all short sounds. Not long and drawn out, but often choppy. Long, drawn out vowels are made by following the vowel with a special character “ー”. The sound of the vowel is exactly the same, but simply spoken longer. Here’s another note on Japanese pronunciation, though it won’t help your reading skills any. Japanese words are not accented. That is, no syllable is emphasized over another. English tends to be spoken a little sing-songy. We place emphasis on certain syllables because of the way it makes the word sound. Take the word “together”. We say “to-GEH-ther”. If we move the emphasis, it sounds weird to our ears. Try saying “TO-geh-ther”. Japanese is spoken with no emphasis. Because of this, I often find it odd how we english speakers often try to add emphasis. I have a friend name Takashi. When he says his name, he says “tah-ka-she” with all of the syllables spoken in even tone. But another friend would always call him “tuh-KA-she”, which I think most people would say, though it’s wrong. Even when we try to correct how a word is pronounced, we often ignore the fact that there should be no emphasis in the word. Take the Japanese word “Karate”, which is pronounced “kah-rah-tey”. Most people say “kuh-RAH-tee”. Then I remember first hearing people trying to pronounce the word better by saying “kah-rah-TEY”. Closer, but still carrying emphasis on the last syllable. No matter, unless you’re trying to speak more like a native Japanese. There are three kinds of script in Japanese. One is called Kanji, and is made up of Chinese characters adopted for the Japanese language. They are not pictograms and not phonetic, so the pronunciation of a Kanji character depends on the word represented. In addition to Kanji, there are two phonetic alphabets: Hiragana and Katakana. While Hiragana is used together with Kanji to complete the written language, Katakana is used specifically for foreign and modern words. Rather than reinventing the wheel, here’s a Katanaka chart I found on the Internet. To open it, click here. Just in case the link breaks, as happens from time to time, there’s another here. You can write the romanized words out by using this chart. 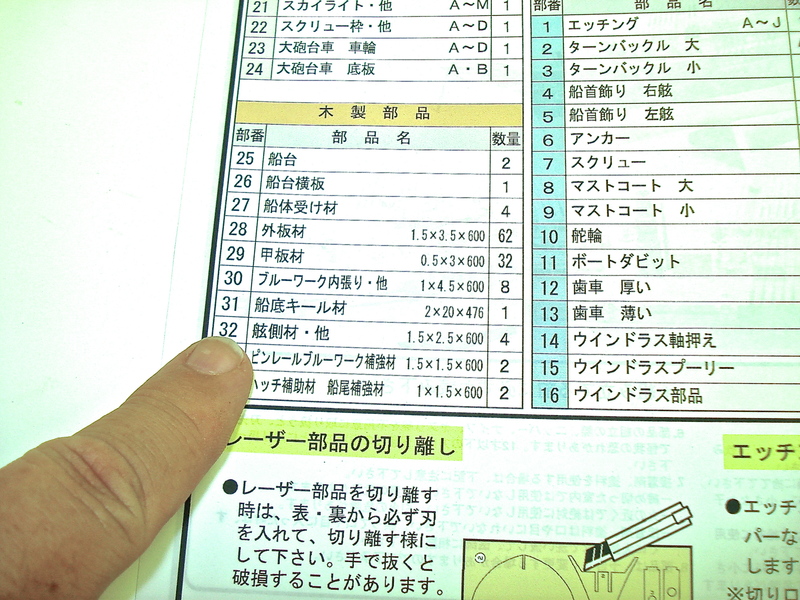 For example アンカー is a,n,ka, and the long line tells you to extend the vowel sound, so you get ankaaa, or “anchor”. Here’s my compiled list of western words you’re likely to find in your Woody Joe ship model kit. Note that these are far less likely to be found in a kit of a Japanese subject, as there are Japanese words for most of the components you’ll find there, except perhaps for modern terms used in instruction and tools. I don’t know of a good way to sort this list if I put the Japanese first. Since you might have an idea as to what the item might be, I’m going to put the english word first and sort the list that way. There are more words that you might run across, but I’ve dug through a few Woody Joe instruction books and found the above to cover the bulk of them. You might note that there are many compound terms using the words above. I’ve include some, like Mizzenmast and Gaff Tops’l, but there are far more that I didn’t include. You can piece these together, like main and top and mast to form メイントップマスト, etc. With any Japanese text, there are plenty of words that are written in native Japanese. Some of this may be in Hiragana, the phonetic alphabet, and some may be in Kanji, or Chinese characters. I’ve decided that the easiest way to sort these is to categorize them by meaning. So, here are some of the terms you may run across. Note that for the sake of completion, I’ve also included words that are written using the Katakana alphabet as well. The diagrams pretty much say it all. As they say, “a picture is worth a thousand words,” and that’s very true here. Woody Joe instructions are very well illustrated, and they do a good job of explaining everything in pictures. However, once in a while, there is some Japanese text printed in red. These are clearly calling your attention to an issue to be aware of, but what issue? In some cases, they alert you to alignment marks laser-etched onto the wood parts, so look closely at the parts and the images when you see red text. In other cases, they are bringing attention to the fact that a wooden part needs to be beveled. Again, look at the images, and you’ll see some illustration showing a beveled edge. Probably the most serious note is a remark not to glue a part into place. How can you tell? Probably the easiest method is to look for red text that’s in bold with exclamation marks at the end. Then, look at following steps to see if the part in question is no longer shown in the later steps. That’s the most obvious indicator, and the one I relied on most. Note that the first two characters represent the verb “to glue,” and the verb endings, しません or しない, make the verb negative. So if you just look for those endings in red, usually followed by one or more exclamation marks, you should catch any warnings not to glue a part. This usually comes up only when one part, like the deck, is used to aid in the alignment of another part, like the frames. I’ve built a half-dozen Woody Joe kits, and I’ve learned a few things about them. This is my personal advice on working with these kits. All but a maybe one or two available Woody Joe kits are laser cut. To improve the quality of the cuts, the company tends to use thinner sheets of wood than European or American manufacturers. Some of these more detailed pieces, particularly ones with a lot of laser etched detail, can be fairly delicate, so take care in handling those parts. Carefully cut them lose, don’t break them loose. The bulk of the wood used in the kits is Japanese cypress, or Hinoki, which is a very aromatic wood. The wood will bend quite easily if dampened, but is quite brittle when dry. So, don’t try to bend any wood without wetting it first. Test this on scrap wood, before trying to bend the real thing – break a dry piece of scrap to understand how the wood behaves. When following the instructions, do so very carefully and precisely. Don’t try to take short cuts, thinking it’s just as easy to do things your own way. These are carefully engineered kits, unlike most traditional ship model kits that leave you to figure out how to do much of the build. So, if you don’t follow the steps, there’s a good chance that something will not fit in a later step – I’ve seen it happen. 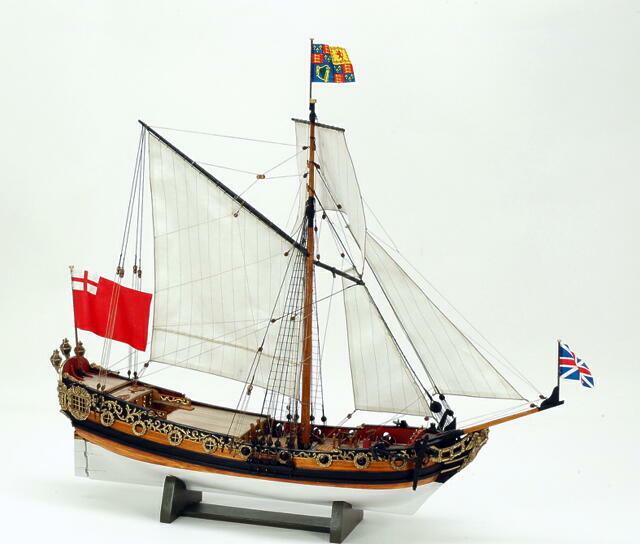 I’ve found Woody Joe kits to be a refreshing change from European kits, and that for the most part, given the company’s heavy use of illustration and nicely laser cut parts, experienced ship model builders will have no difficulty with them. The additional support given in this article may be completely unnecessary. 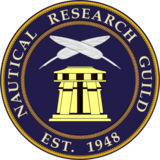 But, it’s my hope that it will encourage ship modelers to try out one of the kits.